With the wonderful old fashioned charm of a vintage car, this is surely the perfect transportation for a wedding day. 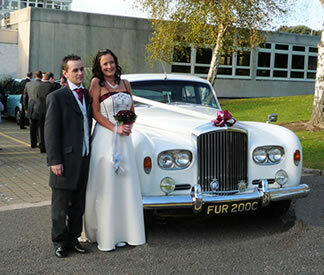 We at Special Day Cars can offer a chauffeured vintage car, to travel you on your way to marital bliss. With splendour and refinement you can be chauffeured perfectly to your wedding venue in one of the most beautifully crafted cars, we have many for you to choose from, including the traditional Rolls Royce Phantom wedding car . With all of the renowned car manufacturers building beautiful cars there are many vintage cars to choose from. Every vintage wedding car that we have in our collection is kept in pristine condition. They are, in fact, the pride and joy of the Special Day Car team. A vintage wedding car will compliment every wedding dress and offer the utmost comfort for a bride on her big day. Not to mention the beautifully romantic wedding photographs for you albums. Our vintage collection is extremely popular for weddings currently. Please see a testimonial below from one of our many happy f.o.b’s. The day went very well, we were lucky in that the sun came out that afternoon after having rained virtually all week previously. The Bentley Silver Cloud was excellent, very clean, with a smart, courteous driver, a credit to your company. Both my daughter (the bride) and her groom were delighted with the car. Please see below our Vintage Modern Fusion Package Deal! !